From my point of view, the French believe in celebrating. Every month and sometimes more often, it seems, there is some kind of ritual that calls for making special foods and having fun. 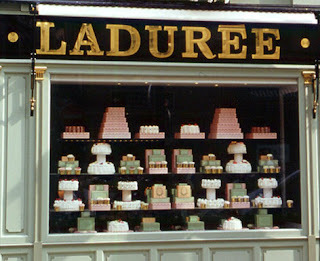 I suppose the cynical would say that it’s just an excuse for selling cakes and chocolates at the boulangeries-pâtisseries. I see it more as a philosophy that rejoices in the small things in life. In the five weeks that we’ve been here, there have already been several of these types of occasions. Many of the current feasts are based on pagan and Christian rituals of the past. Take la Fête des rois, for instance. Once a religious event commemorating the Epiphany or the three Magi’s visit to the Christ Child, the celebration is now non-denominational. 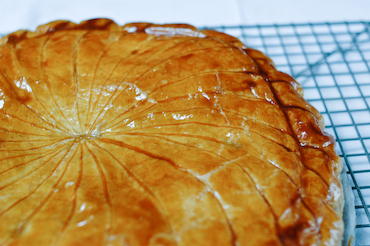 No longer simply reserved for dessert on January 6th, the galette des rois which accompanies the occasion is available in bakeries all month long. This flaky torte is made of puff pastry layered with almond paste. As part of the tradition, a bean or small porcelain favor is normally baked inside and whoever finds it becomes the king or queen of the day’s festivities. Quickly following the feast of the Three Kings comes la Chandeleur, based for one on the presentation of Jesus in the temple. Each February 2nd–far from our groundhog idea—French custom dictates that families make crêpes for dessert. While flipping the skillet holding the thin pancake with one hand, you’re supposed to hold a coin in the other. 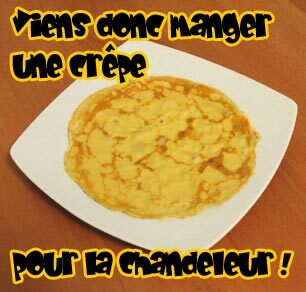 If you can perform the maneuver catching the crêpe in the pan, it is said that you’ll have prosperity all year long. As luck would have it, we were in Lyon this year for Valentine’s Day, February 14th. Known as the gastronomical capital of France, the city offered us many delicious choices for lunch and dinner. 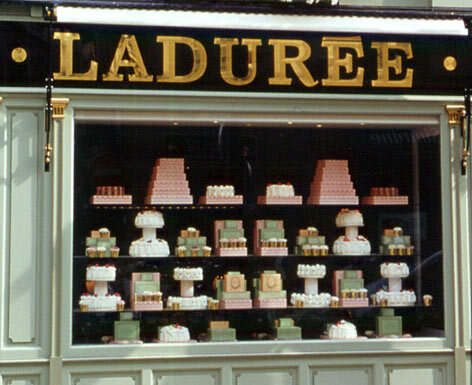 Besides that, the two big chocolatiers on Cours Franklin Roosevelt—Bernachon and Tourtiller—had their front windows full of all kinds of tasty treats for your Valentine. 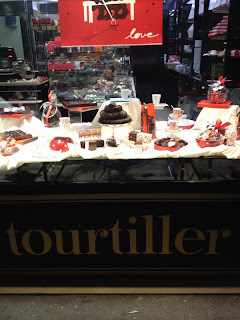 Cakes, tarts, and chocolates were all arranged beautifully and temptingly to celebrate the occasion. And there are plenty more celebrations to come. 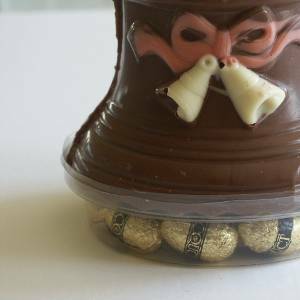 We’re into the Lenten season now and that means that Easter can’t be that far behind. With Easter come lots of chocolate eggs and chocolate bells which replace our bunnies. Either way, bells or bunnies bringing eggs are unique ideas! On April 1st it’s a favorite of school children: poisson d’avril. This is like our April Fools' Day, but with the twist of putting paper fish on someone else’s back. 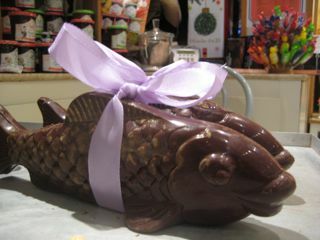 With this celebration, the pastry shops will be filled with chocolate fish! Amusing and delicious! All right, I admit it. I feel about cheese the way some women do about shoes or handbags. It may not be a true addiction, but I do get all tingly and excited every time I approach a cheese counter. 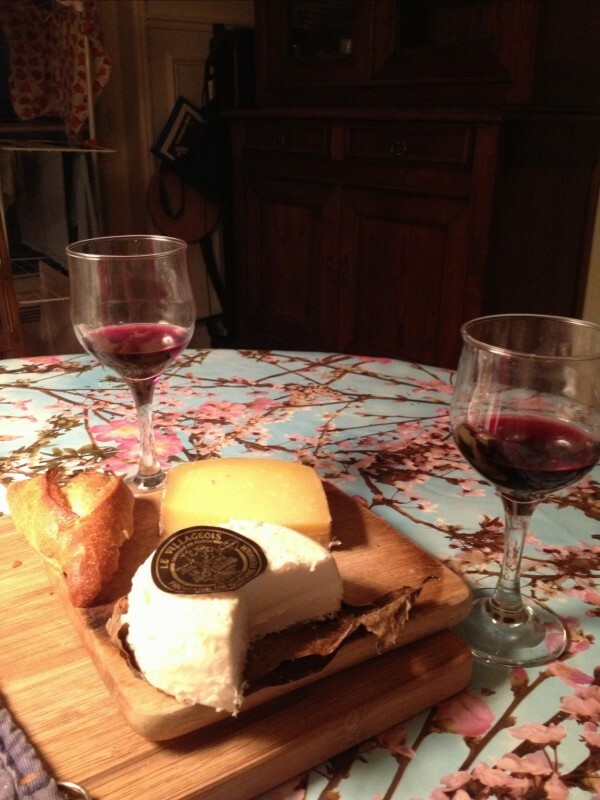 And is there ever a lot to be thrilled about on the cheese-front in Paris! 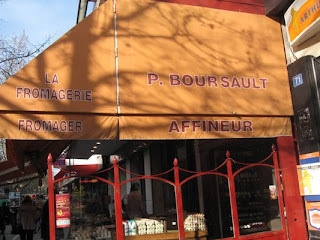 Sure, other French cities we’ve lived in have had their fromageries and they were great. Here though, the amount and assortment are stupendous. It’s enough to make a girl cry from joy! As a general rule, grocery stores in France are the worst place to buy cheese. 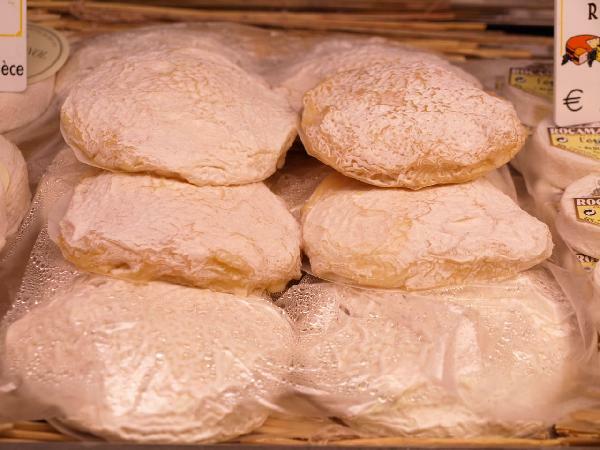 Unless you’re looking for some standards such as Saint-Marcellin, its “cousin” Saint-Félicien, or a Roquefort, it’s best to avoid supermarket cheese altogether. On the other hand, we do have a large Monoprix on boulevard Edgar Quinet with a wonderfully extensive cheese counter (I’m talking hundreds of varieties); it also has a hands-off policy--no touching of the products except by personnel--and a knowledgeable saleslady just like in a fromagerie. 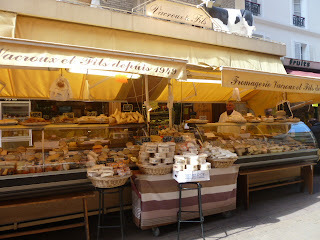 In our neighborhood there are two very nice dedicated cheese shops as well. Because of the quality and the shops' proximity to home, we usually go to either Vacroux et Fils on rue Daguerre or, in the other direction, Fromagerie Boursault. Both have fantastic selections and a helpful staff offering suggestions when asked or when they see a pattern to what the customer prefers. 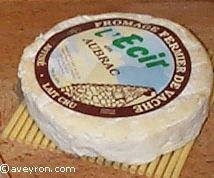 Like the time at Vacroux when the seller proposed a raw cow’s milk cheese called l’Écir from the Massif Central. We loved it! 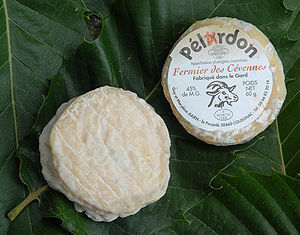 Ever since I first came to France for junior year abroad at age nineteen, I’ve been a huge fan of fromage de chèvre. Who can resist the tang and consistency of a good goat’s milk cheese? These tasty bits come in all shapes, sizes, and styles: dry, soft, ash-covered, pyramid-shaped, with herbs, etc. My favorites by far are the soft, creamy ones. 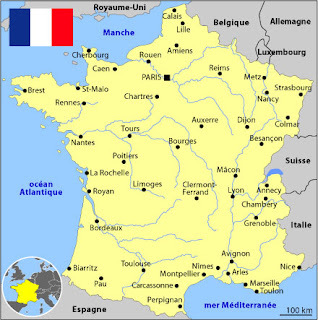 During the past month we’ve tried quite a few; the best for us were a Pélardon from Languedoc-Roussillon in the south, which has an AOC much like many wines, and a Galletout from the Midi-Pyrénées. This last one, completely new to us, has that crapotté or wrinkled exterior, which we call brain cheese. So delicious! My husband likes to have a hard cheese around, so we usually look for sheep’s milk cheeses. 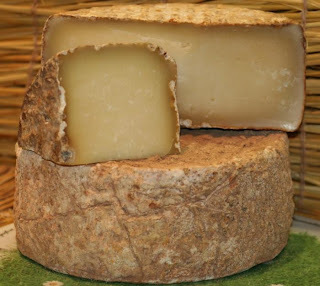 We had a wonderful Brebis corse that tasted like clover and honey to me. Interestingly, Vacroux also had one soft brebis called Laouzou, which I can't seem to find anywhere online but we gobbled up in no time! When I went there this afternoon and asked for a suggestion, the salesperson recommended a Berber Dou Rey from the northern Pyrenees. Don’t know yet, of course, but I’m sure it’ll be terrific. We’ve fallen into a pattern here which consists of eating less meat at dinner time and adding cheese at the end of the meal. Sure, there’ve been some mistakes, like the Brin d’amour, a sheep’s milk cheese with herbs, that neither one of us was too crazy about. In spite of that, we’re having a heck of a time trying as many as we can! Finding a place to live in Paris is quite a daunting task. 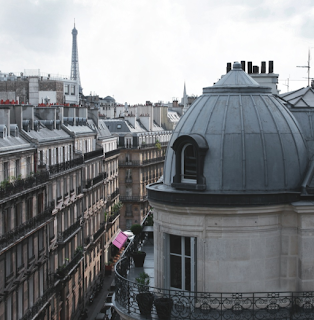 Like any big city, there are thousands of hotels and, in our case, apartments to choose from. When I first began looking for lodging last summer, I checked all of our go-to websites. VRBO (Vacation Rental By Owner) and Homeaway have been very helpful to us in the past—whether planning a trip to California or Europe. 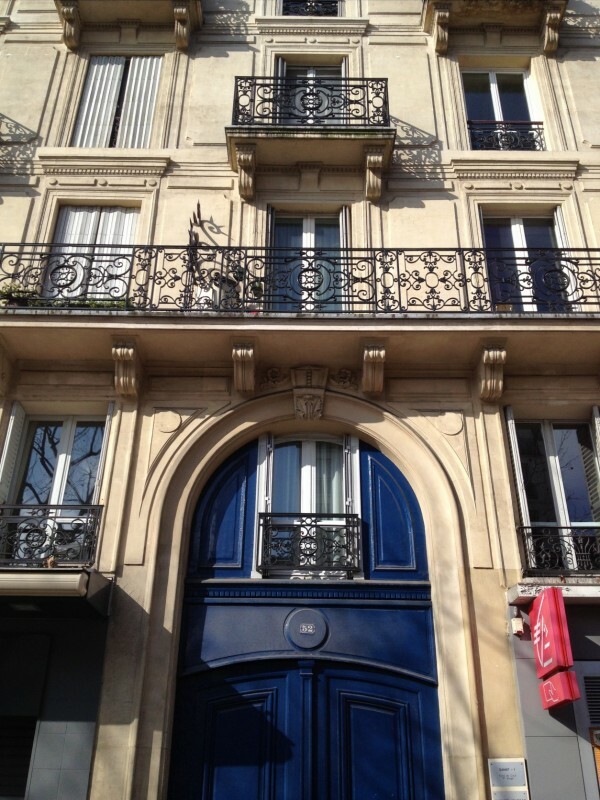 Another popular site is airbnb; Americans and French people alike have told me they have used it and liked it. I was getting a bit frustrated, though, by the small size of many apartments—fine for spending just a few days, but what about five months? We were hoping for at least fifty square meters. Other things to consider, of course, are the monthly cost and the apartment's actual location within the building. You really don’t want to be lugging groceries up four or more flights on a regular basis. Then I remembered having searched Sabbatical Homes in the past. For faculty members looking for apartments to rent this is a great site. Since we already knew that we preferred to live in the fourteenth arrondissement, the field was narrowed enough to enable us to find our current apartment. As I’ve described before, the neighborhood is bustling. Inside, however, we don’t hear a sound, except occasionally someone walking on the floor above. (This will undoubtedly change once the windows are open in the spring, but it’s awfully nice right now!) The building, which is the second one in from the street, is secured with a code on the sidewalk. Then there’s a locked door to get into our building. We really feel safe here. The apartment itself has windows on every side with views onto courtyards besides other buildings. The fifty-four square meter area allows room enough for both of us to get our work done separately. The owners have also provided every convenience: a fully-furnished home with lots of heat and hot water; a well-equipped kitchen (stove, oven, fridge, dishwasher, and microwave); a phone and TV; and, as a plus renting from fellow academics, three tall bookshelves full of books on Paris and other European cities, French history, as well as novels and reference works. I really love having a washer in the kitchen, so I don't have to go out to do the laundry. 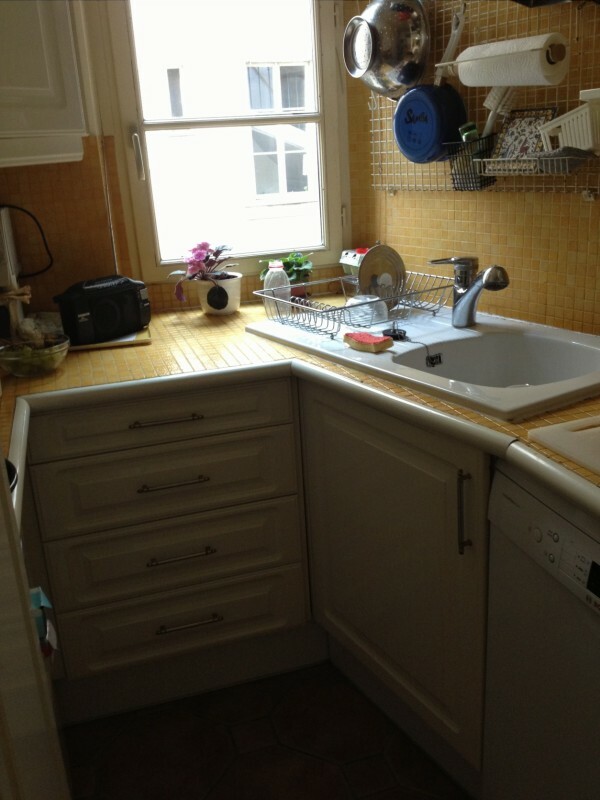 The dining room is especially nice: a round wooden table with six chairs and a large hutch full of tableware. It'll be great for future dinners with friends and family. 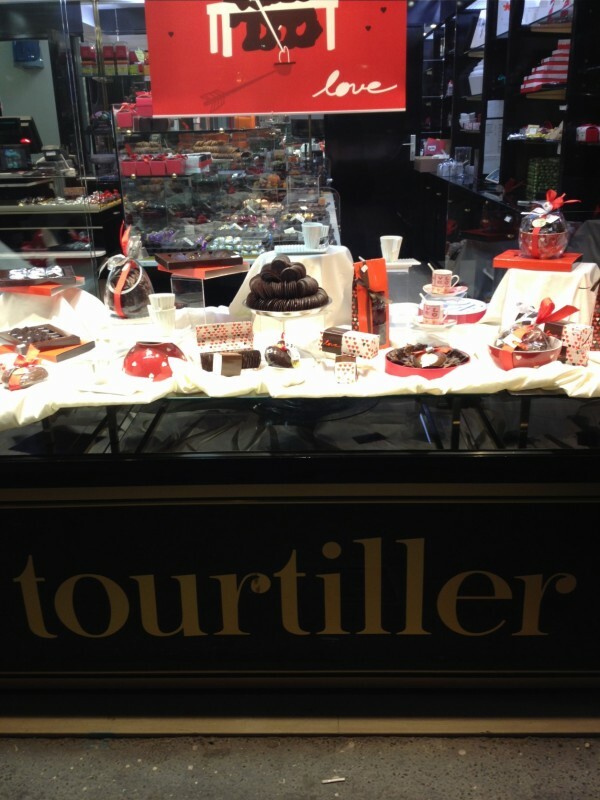 We are happy with our choice and are enjoying our time on avenue du Général Leclerc. 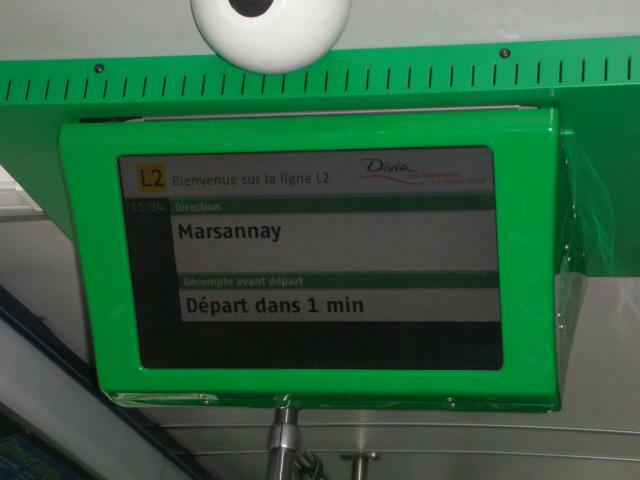 Living in France is nothing new to us. Hard to believe, but it’s already been over twenty years since we moved to Lyon for a year with our two children. 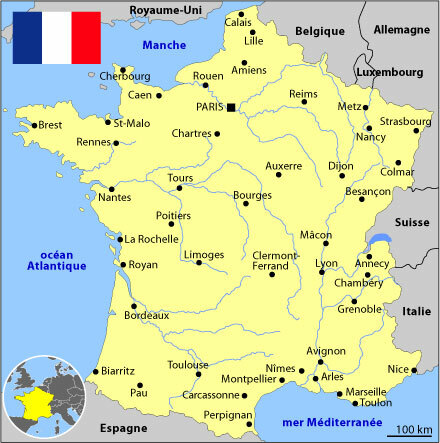 Subsequently, we’ve been fortunate enough to spend one semester in Montpellier and another in Bédoin, a small town in Provence. The last excursion of this type was a mere four years ago, so you’d think that by now we wouldn’t be surprised by what we see. There are a few things, however, that have already jumped out at us this trip. For one, smokers seem to be everywhere. According to current statistics, half of the people in the 18 to 34 age group smoke. Much like in the U.S., they are relegated to go outside of public places with their cigarettes. At first we kept wondering why so many folks were braving freezing temperatures by sitting at outdoor cafés. You guessed it…many of them are lighting up. The evidence is all around: people (a lot of them young and female) walking down the street smoking and cigarette butts strewn all over. Wrought-iron grills around the base of trees are often completely littered with them. We’ve heard news stories since arriving about the prevalence of lung cancer especially among French women. As for why this unhealthy habit continues in the female population, a 2010 article from The Daily Beast points out that French women would rather be dead than fat. Another stunner is how many fur coats you see on a daily basis. Despite the fact that PETA (“pour une éthique dans le traitement des animaux”) exists and that celebrities like Brigitte Bardot are decidedly anti-fur, you see many more minks and other pelts of all shapes and sizes on the streets of Paris than you do in Manhattan. 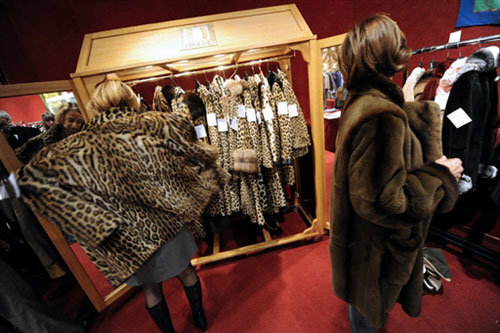 There have been demonstrations against the wearing of fur in the French capital in the past. I guess there have been no incidences of activists throwing ketchup or red paint at fur-wearing people like there were in the U.S. years back. Not all of the surprises have been negative, though. Something we’ve really appreciated in Germany over the years is that there are electronic signs at bus stops and subway stations which tell you when you can expect to get onboard. Just about everywhere in Paris the same is true. Perhaps if public transportation were more of a priority at home, we’d have such a system in place. Finally, in my blog from the semester spent in Provence, I devoted part of one post to the lack of restroom facilities in France. This time, too, we keep saying that French people must have bladders of steel! Although public toilets are few and far between, even in places we would expect to find them like department stores, some WCs are appearing on downtown streets. 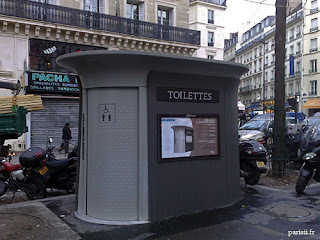 These toilettes are a far cry from the old-style pissoirs that used to be found in French cities; the newer variety is spacious, clean, and free-of-charge. Now if there would just be more of them.